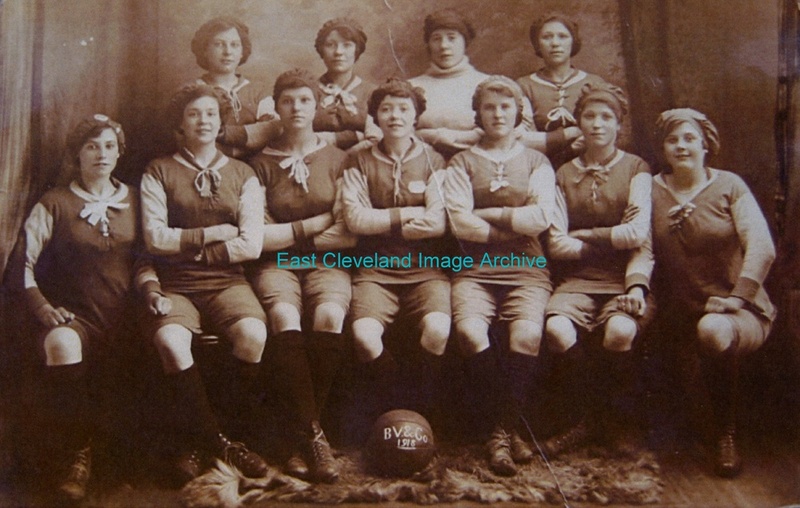 Described as the Runners Up in the Ladies Munitionette Cup in 1918, these ladies would make a valuable contribution to the World War I industry. The team is also named. 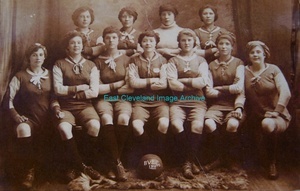 Back row: Emily Milner, Amelia Farrell, Greta Kirk, Violet Sharples. Front row: Elizabeth Powell, Mary Mohan, Mercy Page, Winnie McKenna, Gladys Reece, Olive Percival, Anne Wharton. Image courtesy of the Pem Holliday Collection, identification via ”Grangetown in Times Past”; thanks to Joyce Henry for the update. Whilst Paul Boden tells us: ”I have the same photograph and the information I have is that the lady that is seated second from the right is Florence O Hanlon (nee Short) Florence was the younger sister of William Henry Short VC. Florence and William were first cousins of my mother Caroline Boden (nee Short).”; thanks to Paul for that update. 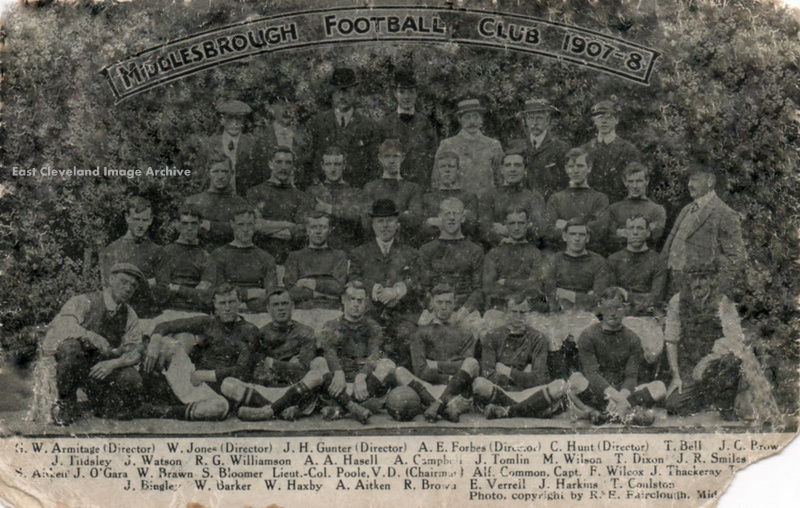 We have names for all the members of this 1905 team for Guisborough, but we particularly like the two gentlemen on the right, complete with bowler hats! Back row: A. 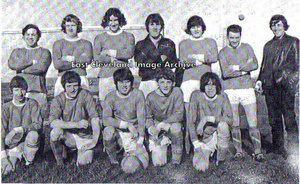 Old, G. Stevenson, T. Smith, J. Kirkconell, H. Mann, W. G. Batterbee, C. Peacock (Captain), J. Coulthard, W. Pybus, H. Bowmaker. Front row: R. Wright, T. Pattinson, R. Williams, T. Darnton, W. Pearson, A. Williams, C. B. Robson (Trainer). Image courtesy of Joyce Dobson & Keith Bowers. 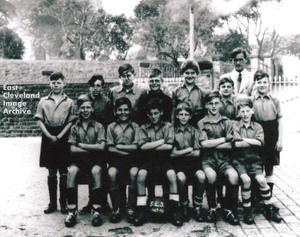 Stanghow Lane School Football Team of 1949. 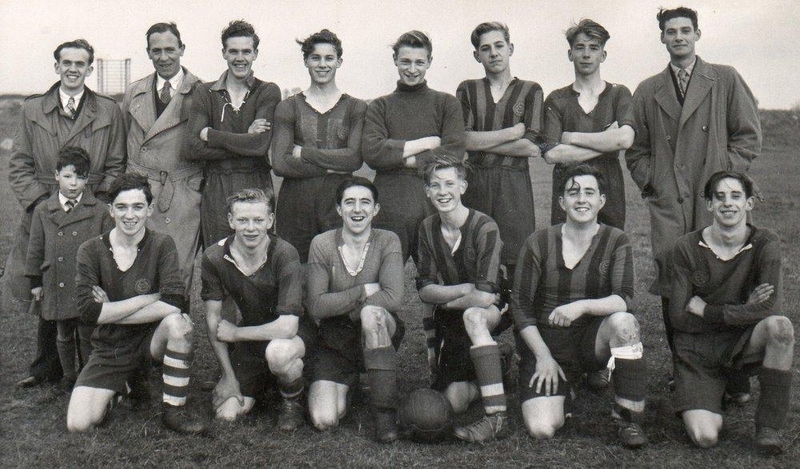 Back row: A Tilley, T Calvert, B Ness, Dennis Preston, Barry Bloomfield, David Hick, Mr Joe Reed, H Breeze. Front row: Jeff Templeman, Gordon Templeman, David Lowe, Keith Gosling, Maurice Ferrer, B Addison. Image courtesy Jeff Templeman; many thanks to Bill for that update and Dennis Preston for the update on names. 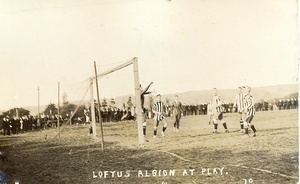 Loftus Albion playing at home, Whitby Road ground; in black and white striped shirts. They reached the semi final of the F.A. 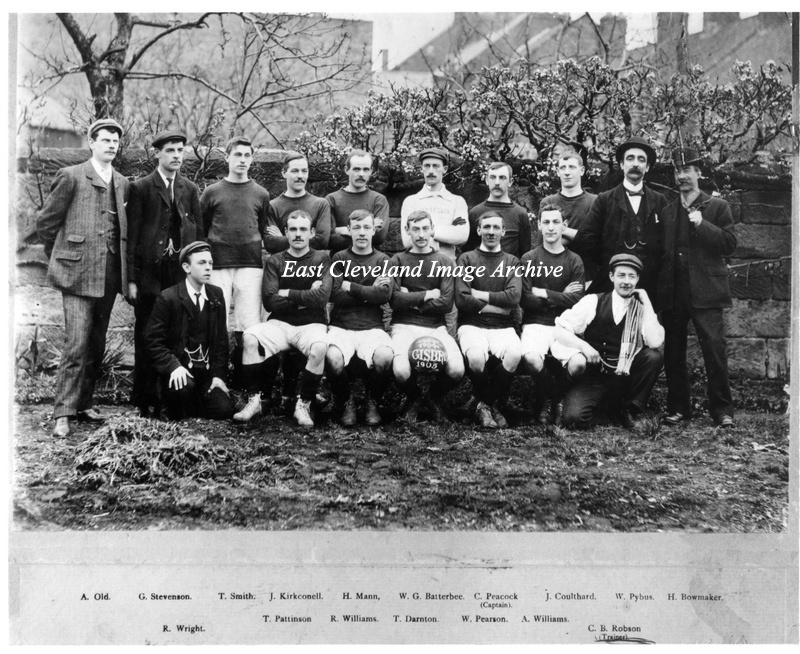 Amateur Cup, from the Cleveland League. Narrowly losing to Bishop Auckland 2 -1 after leading through a Bobby Pitt goal. They were accepted into the Northern League on the strengh of this performance. 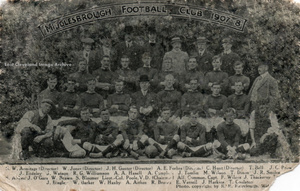 Middlesbrough F.C. 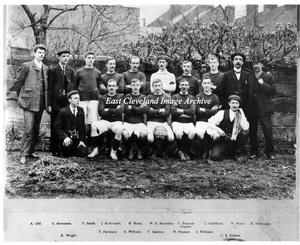 Season 1907/08. one name is missing in the torn part of the card, T Wilson to the right of J Thackery. 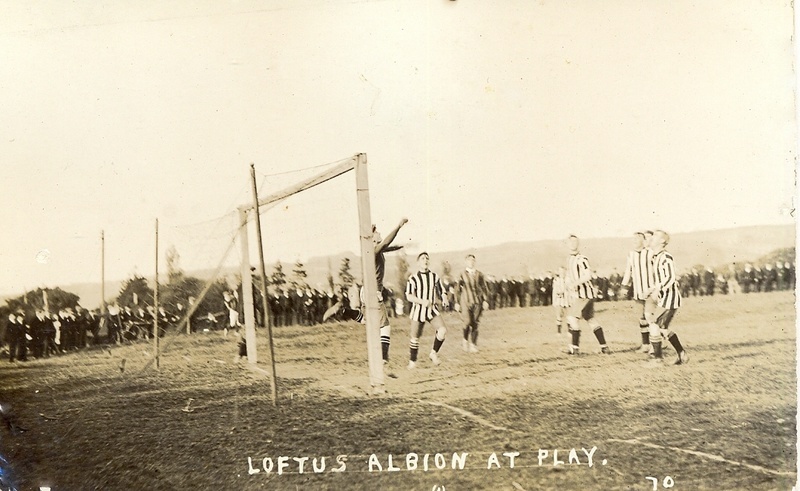 in the english league 1905. And Steve Bloomer £750 in 1906.
both international players. are seated either side of Lt Col Gibson Poole Chairman for many years. 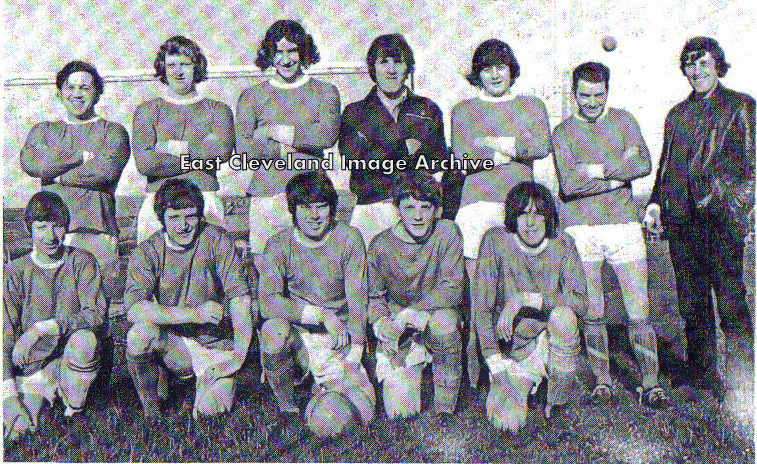 Back row: Richard Barnes, Barry Thomas, Terry Dove, Philip Wilks, Billy Jackson, Micky Wilson, Colin Marshall. Front row: Stephen Hines, Norman Smithers, Lampton Shepherd, Norman Breeze, Eric Taylor. Image courtesy of Colin Hart who would like any information on the Bury cup that you may have; also thanks to Tony and Richard for providing us with the names. Back row LtoR:- Derick Garbutt, Donald Hatton, Brian Ferguson, Billy Winspear, ? ?, George Lettin. Next row:- Micheal Buckingham, John Anderson, Arthur woodrow, Brian Soloman, Norman Hill. Photo courtesy of Maureen Anderson. Back row (left to right): ? ?, W. Driver, ‘Brom’ Williams, J. Hope, T. Gell. 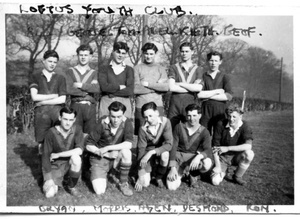 Middle row: A. Goldby, Don Welford, G. Hall, A. Hall, William Carveth, J. Grimstead, L. Nicholson. 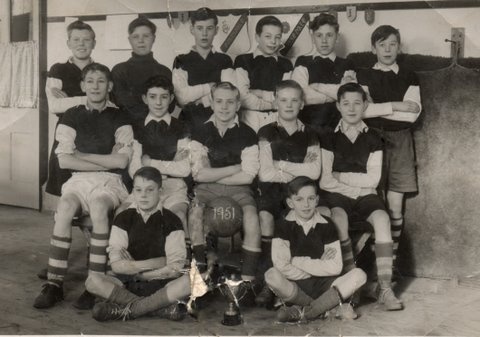 Front row: M. Martin, J. Nicholson, N. Leeks, ‘Pop’ Richards, Jim Grimstead. Ann Robinson tells us: “Don Welford was my Dad. This photograph was taken before he lost his right arm in a works accident at Skinningrove steel works”. Can anybody assist with the missing name? Image courtesy of Maureen Anderson and many thanks to Ann Robinson for the update. 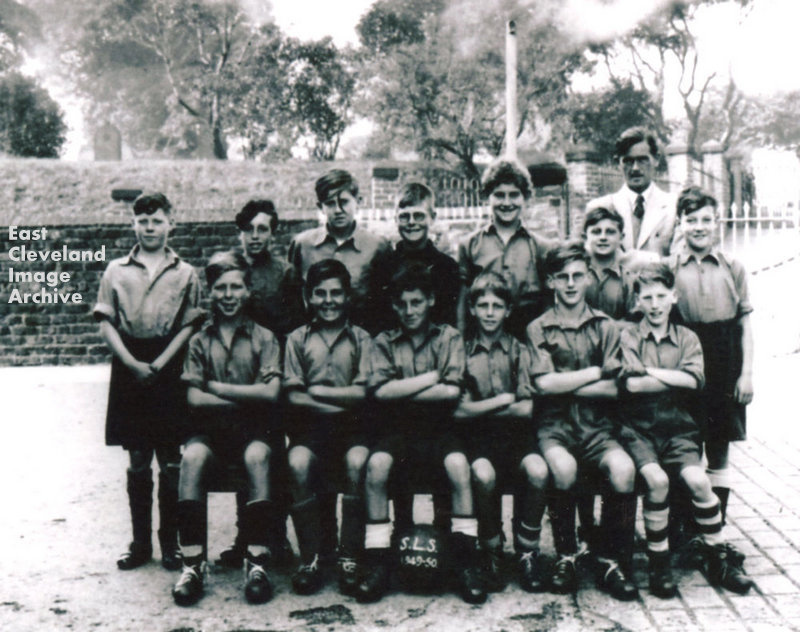 We now know this photo was taken at Whitbyand and we have the names of the lads. Brian Webster tells us of an away match @ Whitby having travelled on the train with the Club Leader Mr Johnson in 1947? 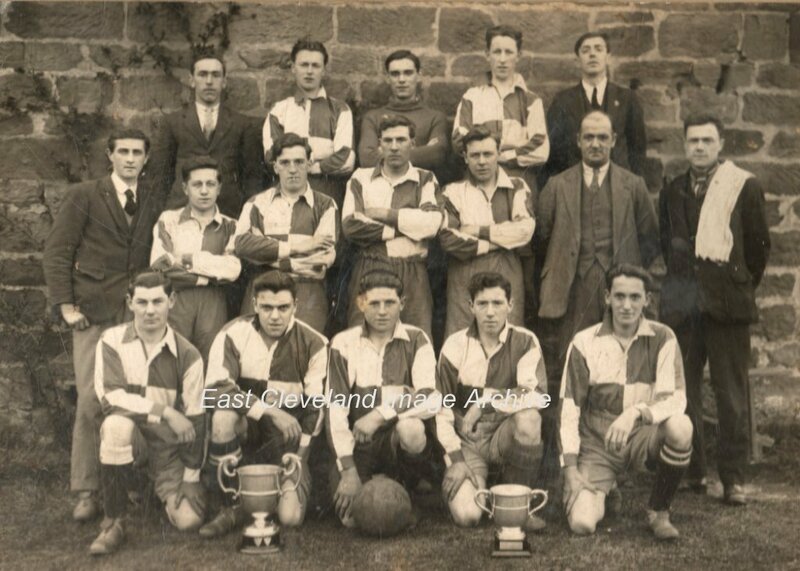 Thanks to Marian Smith for the photo and names, also Brian Webster for the update. Do you recognise yourself here, can you tell us the occasion? 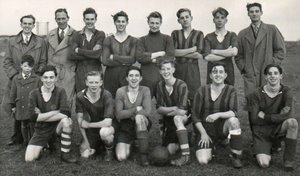 The names are:-Les Webster, Mr Harrison,Fred Halton, Bill Hyde, Brian Stonehouse, Derick Gales, Ted Wheatman, John Bryant, Mr Harrison’s son, Geoff Cox, Dennis Thomas, Charlie Hellings, Col Collinson, Jack Faye, John Frankland. Photo courtesy of Audrey Winspear and thanks to Brian Stonehouse for the update.